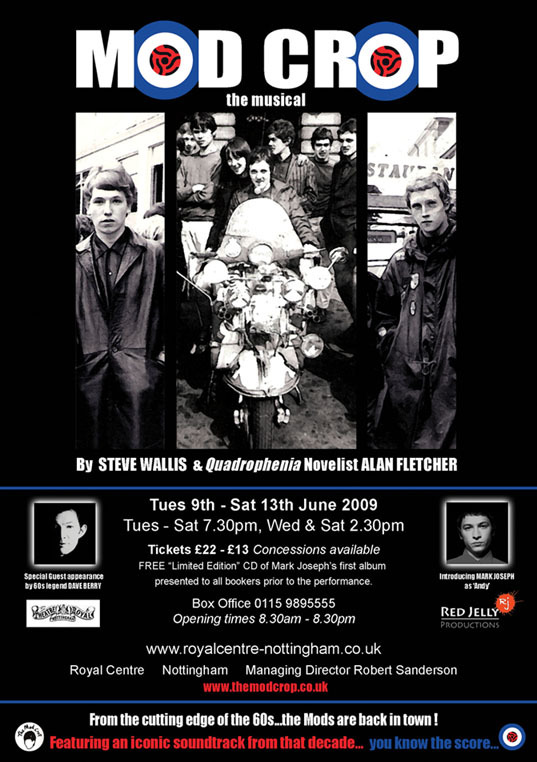 Mod Crop is a brand new musical written by Steve Wallis & Alan Fletcher (Quadrophenia novelist and film consultant) and is based on "Brummell's Las Riff" - the first novel from Alan's Mod Crop Trilogy. Mod Crop is the story of three young mods daring to be different while coping with the traumas of teenage life. The show features mod classics such as Wipeout, 1,2,3, Iko-Iko, Walking the Dog as well as many other fantastic tunes from the 60's - some of which will be performed live by a five piece band. Mark Joseph will be starring in the musical, alongside Dave Berry (Crying Game). Mod Crop debuts at the Nottingham Theatre Royal on 9th June for one week. Subject to contract a nationwide tour will then follow.